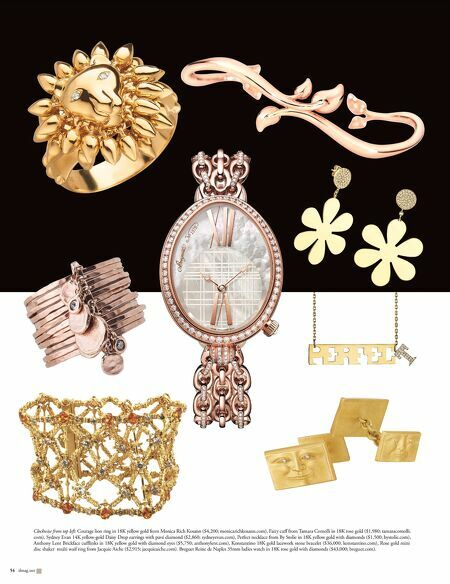 54 slmag.net Clockwise from top left: Courage lion ring in 18K yellow gold from Monica Rich Kosann ($4,200; monicarichkosann.com), Fairy cuff from Tamara Comolli in 18K rose gold ($1,980; tamaracomolli. com), Sydney Evan 14K yellow-gold Daisy Drop earrings with pavé diamond ($2,860; sydneyevan.com), Perfect necklace from By Stolie in 18K yellow gold with diamonds ($1,500; bystolie.com), Anthony Lent Brickface cufflinks in 18K yellow gold with diamond eyes ($5,750; anthonylent.com), Konstantino 18K gold lacework stone bracelet ($36,000; konstantino.com), Rose gold mini disc shaker multi waif ring from Jacquie Aiche ($2,915; jacquieaiche.com). 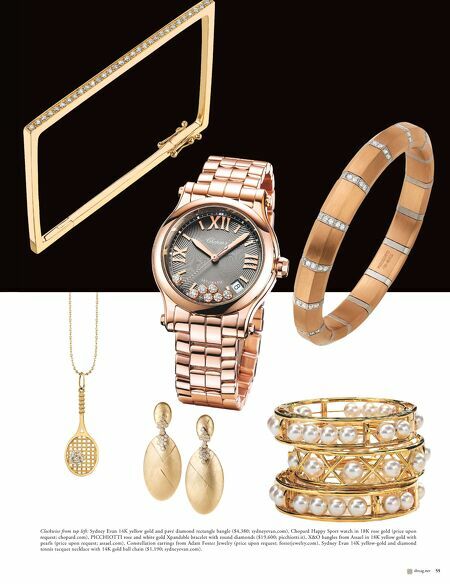 Breguet Reine de Naples 35mm ladies watch in 18K rose gold with diamonds ($43,000; breguet.com).